In Virginia’s most historic town. Or the luxury of your room. The charm, grace and hospitality of the original Watts family and their grand home has been retained by the current owners, Kathy and Michael Bedsworth during their four year restoration of the mansion. The home is a treasure trove, rich with architectural details including many of the original fireplaces (9), mantels, light fixtures, moldings, intricately carved woodwork, doors bath tubs and sinks.. While staying here you will find the atmosphere to be warm and inviting. Guests staying at The Carriage House Inn Bed and Breakfast can enjoy the mansion much as it was back in the 1800’s with some “modern” updates such as shower enclosures in the baths, central air and heat and Wi-fi. 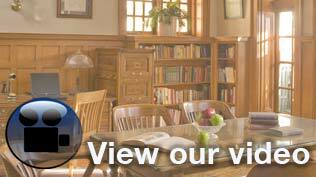 The Carriage House Inn Bed and Breakfast, an award-winning Lynchburg VA bed and breakfast, is located within walking distance to historic downtown. Situated in the Daniel’s Hill Historic District, the inn has the distinction of being the first certified “Green” lodging” facility in the city of Lynchburg! Our circa 1910 Carriage House, renovated in 2009, features two additional guest suites, each with California king beds and a private bath with an antique claw-foot tub and separate shower. On the main level we’ve created a meeting and event venue, a great place to plan a shower, birthday or anniversary celebration, a family reunion or other function. Our guests love to explore the area, and there is so much to see and do that many of our guests make return trips. However, the best reason to visit Lynchburg is to get away from the rat race and relax. The downtown dining experience offers a wide variety of cuisines, many in historic structures. There are four colleges in and around Lynchburg and a host of historical sites and outdoor activities to keep you occupied. The Inn is just 6 blocks away from hiking and biking trails through Blackwater Creek or along the James River. 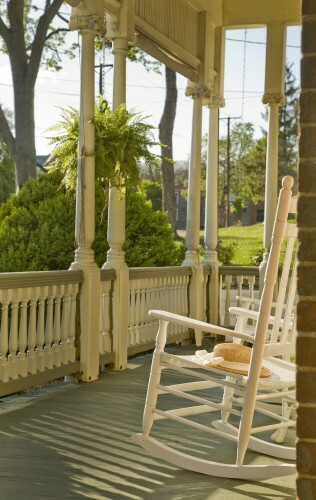 Our wrap-around porch invites you to relax in a rocking chair to read a good book. Or just sit back and enjoy the hospitality, the peace, and tranquility found while relaxing on our backyard patio with fish pond and waterfall. Each morning enjoy our legendary breakfast before visiting one of the many historic sites, cultural activities, or the many outdoor activities. For those wanting to be pampered our massage and body treatment studio is now open and offers a selection of massages and body treatments. This is the perfect setting for engagements, weddings, honeymoons, romantic getaways, girls’ getaway weekends, anniversaries, birthday celebrations, family reunions, and business retreats, and it is the ideal place to relax, rejuvenate, and reconnect. Thinking about visiting the Civil War sites, we are an inviting alternative to an Appomattox hotel. Lynchburg is located only 20 minutes away from Appomattox Courthouse. Twenty minutes in the other direction is Bedford, where Thomas Jefferson built his summer retreat, Poplar Forest. The National D Day Memorial is likewise near there so don’t be alarmed if you can’t find any suitable Bedford Lodging we are close by. Escape from the ordinary and come discover why the readers of Lynchburg Living voted The Carriage House Inn Bed and Breakfast as the Best B&B in the area. Read a story about us from the Washington Post. A Note from the Innkeepers…. Have you been working too hard? Has it been awhile since you have relaxed? Then it is time for you to visit The Carriage House Inn B and B and take advantage of our LaStone® Massage Special. Guests staying with us a minimum of 2 nights are being offered a 20% discount (originally $125) on this massage treatment. Relax in your over-sized room. Start each day by enjoying our legendary 4-course breakfast, featuring a signature dish. Take advantage of the history, wineries, outdoor activities and more that Lynchburg has to offer. Must be booked by calling 434.846.1388 and mention “LaStone® Massage Special.” Reservation must be made at least 72 hours in advance of your arrival and is subject to availability. Cannot be combined with any other special, package, discount or promotion. Gift Cards (except those issued by us) can’t be used with this special. This special is only for NEW reservations made after April 1, 2019 . Stay must be completed by August 15, 2019. Call 434.846.1388 today to book your “LaStone® Massage Special” today!